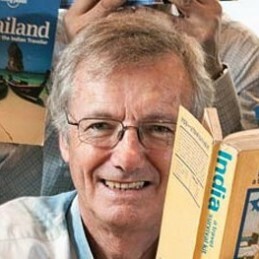 Tony Wheeler AO, is an English-Australian publishing entrepreneur, businessman and travel writer and co-founder of the Lonely Planet guidebook company with his wife Maureen. His father worked for the British Overseas Airways Corporation as an airport manager, so he grew up in Pakistan, the Bahamas, Canada, America and England, never spending as much as two years in the same school. Wheeler graduated with an engineering degree from Warwick University and an MBA from London Business School. After travelling across Europe on a shoestring with Maureen Wheeler, the pair arrived in Melbourne in 1972 with 27 cents between them, and put out their first book, Across Asia on the Cheap, from their kitchen table in 1973. This would grow into the Lonely Planet empire, a name derived from a misheard song (the lyric was, in fact, “Lovely Planet”). The Wheelers always saw Lonely Planet as a business, yet it took a while to become successful – in 1975, Maureen had to work to support the couple. Yet in 1980, the publication of a guidebook to India effectively doubled the size of the company. The first print run was 1500 copies, hand collated, hand trimmed and hand stapled. Tony and Maureen took the book around to bookshops in Sydney and it sold out in the first week. 18 months in South-East Asia resulted in their second guide, South-East Asia on a Shoestring, which they put together in a backstreet Chinese hotel in Singapore in 1975. The ‘yellow bible’, as it became known due to its distinctive yellow cover, soon became the guide to the region. It has sold well over half a million copies worldwide and is now in its 13th edition, still retaining its familiar yellow cover. Today there are over 500 Lonely Planet titles in publication, each one with a ‘between-the-lines message that travellers should respect the planet they wander’ (San Francisco Examiner), and an adventurous, independent approach to travel. In addition to practical travel information each guide contains concise background information on the culture and history of the countries covered in the books. BBC Worldwide bought 75% of their share of the company in 2007 and their remaining 25% in February 2011, bringing the couple’s net worth to $190 million. After the 2007 BBC deal, Wheeler and his wife established a charitable foundation, Planet Wheeler, which funds over 50 projects in the developing world. In the 2014 Queen’s Birthday Honours List, Wheeler and Maureen were both appointed as Officers of the Order of Australia (AO), each for “distinguished service to business and commerce as a publisher of travel guides, and as a benefactor to a range of Australian arts and aid organisations”.